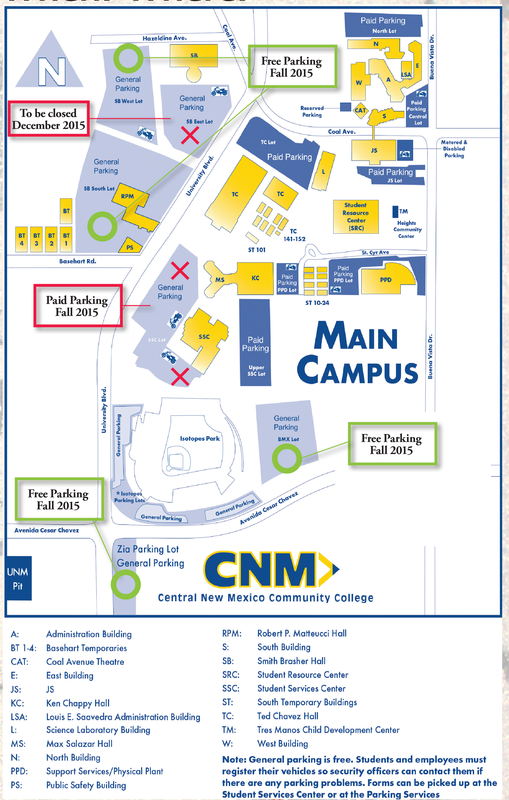 There will be a few changes to parking for CNM students come the fall semester, said Nicolas Aragon, CNM parking services manager. The first major change to occur is that the well-known free SSC/MS parking lot that is located west of the SSC and MS buildings will become paid parking, he said The lower section of SSC/MS and the upper SSC section will be a combined paid lot and students will need to buy an SSC permit in order to park there, he said. Students can purchase paid parking permits at the Cashier’s Office he said. “If you wish to park in this paid lot you will need to buy a SSC permit and citations will be issued starting the first day of class in all paid lots,” Aragon said. There will be no grace period for citations at the paid parking lots, he said. The general parking lots for the coming fall semester will be the SB1, SB2, SB3, and BMX, he said. To pick up general parking permits for the coming fall semester students need to go to the Student Activities office not the security office, he said. The SB parking lots are all located west of University Blvd between the SB and RPM buildings, according to CNM. The BMX parking lot that is located east of the Isotopes baseball park and is accessible from Avenida Cesar Chavez, Aragon said. In the instance that there is not enough parking, the overflow lot for general parking will be the UNM stadium west lot which is located to the west side of the UNM football stadium, he said. There is a grace period during open registration and the first two weeks of the term that citations will not be issued in the general parking lots only, he said. Students who are wondering about the SB construction affecting parking for the fall term should know that construction on the SB building will not be starting until December of 2015. The construction should not affect parking for the fall term, he said. “I am working on a solution that will ensure CNM students will have a place to park that is safe and secure during this construction starting in December 2015,” he said. Students should be aware that when they pick up their general parking permits they are to be placed in a different location than before, said CNM parking services. The permits will now be placed on the inside of the car, they said. There is a typo on the back of the general permits that say to place the permit on the upper left driver side corner of the vehicles interior windshield, he said. The location that the 2015/2016 CNM general parking permit is to be placed is on the lower left driver side corner of the vehicle’s interior windshield, he said. “This is a different kind of permit than we are used to, you no longer have to put unwanted stickers on the rear of your vehicle,” Aragon said. This new cling general parking permit will expire August 14th, 2016 and is kept inside the vehicle, he said. “As long as the permit is visible in either the upper left driver side corner or the lower left driver side corner of the interior windshield it will be accepted,” Aragon said. Paid parking permits will be available online for students starting August 10th, 2015, he said. The paid parking permits can be ordered online through myCNM and can then be picked up at the Cashier’s Office, he said. To purchase a paid parking permit in person students should go to the Cashier’s Office, he said. “The paid lots are never oversold and individuals on the waitlist will be contacted only if lot capacity allows for additional permits to be sold,” Aragon said. Visitors to CNM are expected to park in the parking meter spaces, or in any general parking lot during open registration, he said. After open registration is over and classes have started visitors will need to obtain an E-permit or day pass in order to park in general parking spaces without citations. To obtain an E-permit visitors can go online to cnm.edu and under parking services there is an option for visitors to select E-permit. If visitors would like to obtain a day pass in person they can visit the Student Activities Office, SSC Welcome Desk, or the security office in the PS building, Aragon said. “Parking Services cares about your education and safety, and with new management we are working very hard to ensure our visitors and new students have a good experience when coming to campus,” he said. For more information regarding parking, students and visitors can call parking services at 505-224-4637. For more information on purchasing paid permits, students can call the Cashier’s Office at 505-224-3471.